As the Christmas festivities kick in, the annual discussion concerning what to contribute to the meal occurred. Unsurprisingly, I was given the task of making sausages and supplying meat. Along with four other families we attend a Christmas Eve dinner where I offered to bring sausages, and I offered a wide array of varieties. The hosts requested the old favourites of pork, pear, blue cheese and walnut. The hosts had eaten these previously and were keen for more. 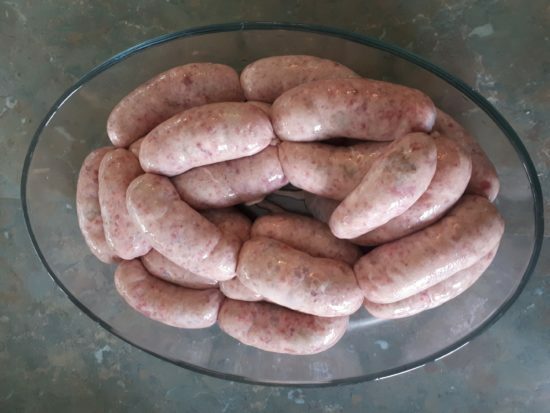 Of all the sausages I make, this variety is one that receives the most positive feedback. 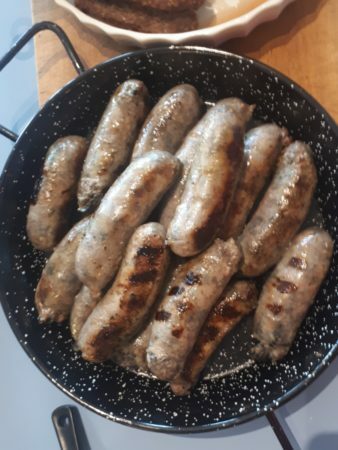 So I made a couple of dozen of these sausages. With a few vegetarian kids present (none are mine are I hasten to add) this was easily more than one each. 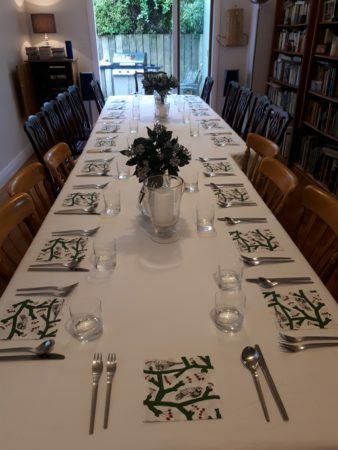 A large cooked ham, roast potatoes and salads were also served. At the dinner the sausages were quickly snaffled up. A few people commented to me that when they went back for seconds they were all gone. One comment I received that night was – that they did not like the walnuts. My view is these add crunch and texture to the sausage, but this person would have preferred a walnut free sausage. Everybody is entitled to their opinion. 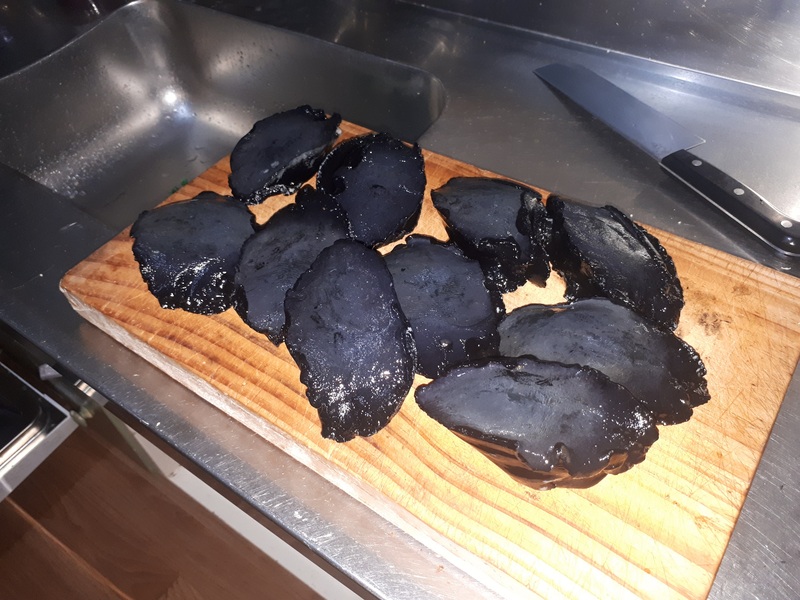 For the whanau lunch the following day, I made paua sausages. These are a favourite of mine. I obtained ten paua from an acquaintance who is a keen diver – I trade them for my homemade sausages. I used 500g of minced paua for these sausages, adding a 1kg of minced pork shoulder and caramelised onions. As ever these sausages were well received. They were cooked on a barbecue along with an eye fillet, and cavapcici sausages from Park Avenue Quality Meats. . The boys especially loved the eye fillet. It was steak could be cut with the back of blunt spoon. The cavapcici are a mild skinless sausage made from beef and pork with garlic and paprika added for extra flavour. Also served was salmon, new potatoes, asparagus and salads. I always enjoy smoked food and I accompanied my meal with a smoked beer from SUP Brewery – Peter Who. I enjoyed this beer, I would describe it as stout with a pleasantly pronounced smokiness in the after taste. 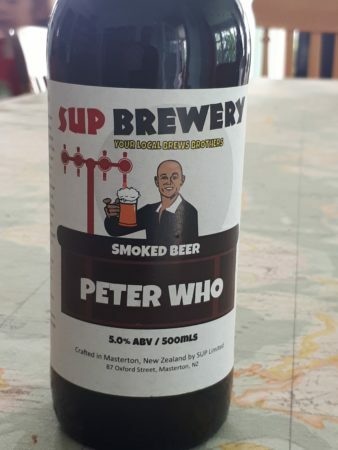 The website from SUP Brewery say this beer was named after Peter Snell, and will attract rough rugged Kiwis who handle running a 100 miles a week. While I am not quite in this category, the leg continues to improve and I am looking forward to competing in the Jumbo Holdsworth Trail Run in a few weeks. Both meals were a fine time with whanau and friends. Lots of talking and even some listening. As we move into January I am looking forward to heading off to the beaches of Raglan. One of the attendees (me) on Christmas Day event even went to Park Avenue Meats to purchase some cavapcici. Unfortunately, this errand will need to wait until the middle of January. We feel very honoured by the efforts you make to produce good food. Thank you.